In my experience, there are three top contenders that derive the stress in my life. Number one – there is just too much on my plate, whether self-imposed or otherwise. Number two – things have not gone according to plan (we touched on this in the last coaching episode). And number three – I haven’t set strong enough boundaries, so I’m allowing people to treat me, or expect things of me, that are not okay with me. Are there other triggers for stress, yes, absolutely, but we all have our top three. These are mine, and perhaps you can relate. I used to have TERRIBLE skills in boundary setting. I mean… I’d let people talk to me in a certain way. I’d put up with crappy behaviour. I’d take on way too much at work because I was afraid to say that it was too much. Am I always great with boundaries now? I’m human. This is a daily practice, because whenever you master one level of something, you reach a new level that pushes and challenges you in new ways. So, I’m learning, but based on years of therapy… here’s what I’ve got for you. First of all, in the most simplistic terms, a boundary is your definition of what you are and are not willing to take from someone, and what you are or are not willing to share with someone. This podcast is a proud member of the Alberta Podcast Network, powered by ATB. If you love the idea of recasting your favourite (or not so favourite) movies, then check out Repodcasting, a member of the Alberta Podcast Network. This month on Let’s Do Coffee they’re joined by Sylvia Cheverie of Chartier. If their behaviour is something you’re willing to deal with, then that falls within your boundaries. If their behaviour is NOT something that you’re willing to put up with, it is outside of your boundaries. If you are comfortable sharing with them, that is within your boundaries. If you are not comfortable sharing certain things with them, that it outside of your boundaries. They are different for different people. Within a single relationship they will change over time. They are yours and yours alone to determine. They are yours and yours alone to enforce. I’ll dive quickly into these before moving into your questions. And, heads up, big thanks to my Instagram followers for sending in such great questions. I think this is how I’ll operate going forward – asking you what you have questions about around a certain topic in advance of writing and recording coaching episodes, so if you want to have your say and get your specific questions answered, follow me @stresslessladies over on Instagram. Boundaries are different with different people primarily because of trust. You might have two siblings, but you feel that you can tell one certain information that you trust less with the other. That’s okay! We need to trust our gut instincts. Within a relationship, you will notice your boundaries change over time. I often see that people in the early stages of a relationship, who are deeply, madly in love, want to share everything and anything with that other person. And in those same relationships, I see over time that people need and crave a boundary for personal space, particularly once people have kids and feel that they are constantly beholden to others. That’s okay as well! Nobody else gets to determine what is okay behaviour or sharing for you. You know what you are and are not comfortable with. I was sent this image from Elizabeth Gilbert’s account and it really struck a chord. 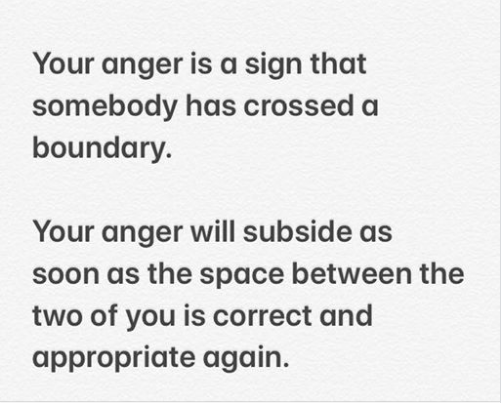 If you’re feeling anger towards someone… they’ve crossed a boundary, even if you didn’t realize it was there. We all have people that are triggers for us. We have people that with simply a look or a phrase can boil our blood, and it’s likely because we have repeatedly let them cross certain boundaries, to the point that almost any interaction with them becomes tainted. Now here’s the hard part – you have to do some thinking about where your problem areas are (home, work, relationships, etc. ), and who your trigger people are. Once you know those two things, then you can really hone in on what the exact behaviours are that cross your boundaries and what you are or are not willing to share. To help you figure this out, look at the scenarios that really upset you. I’ll give a personal example – my parents got divorced a few years ago, and it’s been an ongoing challenge for my brother and I to determine how we support one another and talk about them. Well… turns out the best scenario (a boundary created by my brother), is that we simply don’t talk about my Dad anymore. We have different feelings about him in different scenarios, so talking about him only upset me. Boundary created, and since then things have been a lot smoother. So, what does it sound like to create and enforce a boundary? Well, I have daily practice in this with my toddler, and to be honest it’s no different with adults, bar the recourse. With my toddler, I will tell him when certain behaviour is not okay, I will explain why it’s not okay, and I warn him that if he repeats that behaviour there will be a certain outcome (time out, taking the toy away, etc.). Sounds simplistic… but it’s the same with adults. Much like with toddlers, adults will test us. 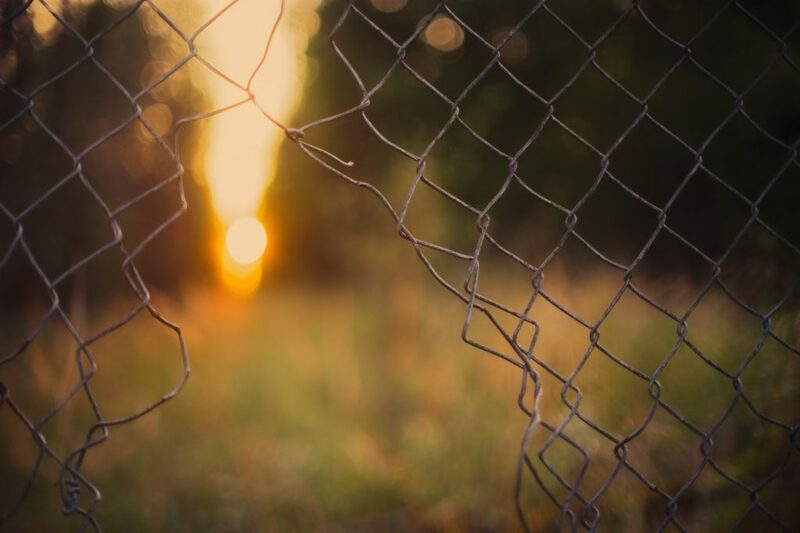 You set a boundary and someone WILL try and cross it, which is why it’s your responsibility both to communicate the boundary and to enforce it. Because, I guarantee serial offenders will not respect the boundary until you do. Q: My partner doesn’t believe there should be boundaries in a committed relationship – how do I reinforce them without resorting to door slamming (half joking!)? Great question – I wonder if your partner is confusing boundaries with trust and honesty? In a committed relationship, yes, you absolutely want to be able to discuss anything with that person and know that you can 100% trust them. Trust and honesty is NOT equivalent with boundaries, though there is overlap. I especially see this in relationships (marital or otherwise) where you combine an introvert and an extrovert. The introvert NEEDS time to decompress and collect themselves. It’s an implicit boundary, whereas an extrovert might want to constantly talk about it. In my personal life, I found that staying home on maternity leave made my CRAVE conversation with my husband the SECOND he walked in the door. I’d been with children all day and I just wanted some adult company. My husband? He’d been around clients all day and needed just a minute or two to transition. He had to explain this, enforce the boundary, and then I came to understand that in order to have both our needs met, I needed to give him a couple of minutes breathing room. So, while it can be tempting (and easy in the moment) to get frustrated and want to walk away and slam the door… try going back to basics. Explain to your partner what your boundary is, why you need it, and explain that if they don’t respect it, you’ll have to remove yourself from the conversation and get a breather. This will take practice! Like I said, when we’ve allowed our boundaries to be crossed again and again and we haven’t enforced them, we’ve sent the message to others that their behaviour is okay. We need to retrain them and ourselves, which will take time. Stay the course. And you could even open up the conversation to them about what their needs are with boundaries and how you can support them. Q: How do I communicate my boundaries in advance? So, this is a tricky question. Without the context of who, when and where, I’m going to have to make some general guesses. Advance notice is relative to the situation. If there are people and situations that consistently come up and cross your boundaries, then you need to address it head on. Let’s take an extended family gathering for example – maybe you have an aunt or an uncle who really gets under your skin. ADVANCE notice would be telling them before the gathering what your boundary is… but we all know that’s unrealistic and likely to cause an issue before it’s actually happened. In these situations I think you need to mentally rehearse the situation. If you know it’s going to come up, you likely know how it will be instigated. Say you have a relative who judges your parenting. You know that at some point that will come up, so mentally prepare for how you would phrase the boundary and how you’ll handle it. Advance preparation and thoughtfulness will make all the difference. So, in the moment, your aunt makes a judgemental comment about your parenting. Heads up – again, the first time you do this, it’ll be new for that person, so they might get a bit upset and taken aback. That’s okay. As long as you’re not unnecessarily confrontational, then you’re respecting each other. Hard part – they cross the boundary again? FOLLOW THROUGH. Do what you said. Walk out of the room, but explain why. “I’m sorry, but I did say that I didn’t want to talk about this, so I’m going to remove myself from the conversation.” And walk away. It’s like dealing with toddlers. You say you’re going to give them a time out? Do it. Otherwise they learn that they can walk all over you. So, perhaps the advance part is more like in the moment, but with advance preparation. Q: How much do I share at work? How much do I share about my personal life? How much do I share about my side hustle? This is such a personal thing. Again, it comes down to what are you comfortable sharing? Does it give you a niggling feeling? Then it’s probably crossing your own line. What do you WANT to talk to people about? Do that. Now, if people are asking you about certain things that you’re uncomfortable with, whether at work or elsewhere in life, it’s up to you how much you share. There are certain ways we phrase sentences that invites more questions or which close down the conversation. Someone could ask, “how is your side business going?” If you’re not comfortable talking about it, you simply say, “It’s going great, thanks for asking.” End of. You can choose to deflect to another topic, or you can tell them more if you’re comfortable doing so. A lot of people worry that sharing personal things will come back to haunt them. Here’s the thing – they might, but you don’t know that in the moment. You have to decide for yourself, at this point in time am I comfortable sharing this? When I was backpacking Southeast Asia, a lot of folks from work were following my blog. I decided to write and share about my experience travelling with depression. I hadn’t told many people about my depression before, and I remember my father telling me not to do it because people would think differently about me. I had to decide for myself if I was comfortable with it. That didn’t take the uncertainty out of sharing, but I had made the decision that if I helped one person by being open and honest, then it was in line with my values. If someone judged me for it and that affected my work, then it wasn’t a place I wanted to work. And it turned out fine for me. Q: I want to do everything. How do I tell myself no? Ah… boundaries with oneself. These are the hardest, in my opinion. As someone who is recovering from the “I’ll do it all” mentality, I know how hard this one is. This is where I truly think therapy can be helpful as a starting point. A good therapist can help you figure out where this need to do it all comes from. For me, doing it all means I have control. And my need for control is rooted in feeling out of control in so many scenarios. So, I notice that when areas of my life feel outside of my control, I revert to taking control of EVERYTHING ELSE. My parent’s divorce during my pregnancy? I took nesting to a new level. I needed to do this, that and the other. The dishes had to be done MY way. The laundry needed to be folded MY way. Organizing the storage room needed to be done MY way. Here’s the thing, if that SERVES you and whoever you live with, then fine. But if it doesn’t (and I’m guessing that it doesn’t seeing as you asked about it), then you need to figure out what matters most to you. What are your values? Who is the person that you want to be? Not what do you want to have, but who are you trying to be in this life? When you’re clear on what your values and priorities are, THEN ask yourself with each thing that you take on whether it aligns with those values. And let me be clear, doing the dishes rarely aligns with anyone’s values, but sharing the load vs. taking it all on yourself will align with your values one way or another. Holy smokes folks – these were some great questions and I really appreciated the engagement. Like I said, I’ll be doing this going forward. I plan to announce on Insta stories a week in advance of coaching episodes what the topic will be and what your specific questions are around it, so if you want to have your question answered, follow me at @stresslessladies on Instagram. I’ll always keep your questions anonymous unless you tell me otherwise – that’s my boundary!